A black Infinity coupe sustained significant front-end damage Sunday about 4:30 p.m. when it struck a four-door vehicle that was crossing Iowa Highway 141 Diagonal on 150th Street. Two vehicles collided about 4:30 p.m Sunday on Iowa Highway 141 Diagonal at 150th Street southeast of Woodward, causing air bags to deploy but no injuries. 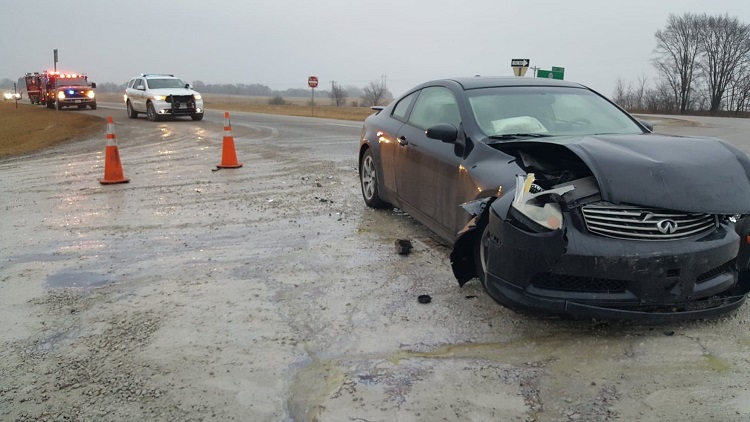 An emergency responder said it appeared a black Infinity coupe was eastbound on Iowa Highway 141 Diagonal and approaching 150th Street when a four-door passenger vehicle crossed the state highway on 150th Street and entered the path of the eastbound vehicle. The Infinity sustained significant front-end damage, and the four-door vehicle sustained sgnificant passenger-side damage. The incident is under investigation by the Dallas County Sheriff’s office. The Woodward First Responders and Woodward Volunteer Fire Department also responded to the accident.